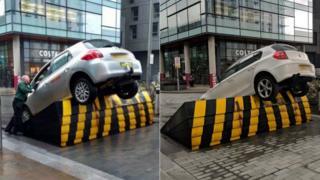 Two drivers became stuck when their vehicles were upended on a rising security barrier. Both motorists, one driving a taxi and the other a BMW, were caught out within an hour of each other at MediaCityUK in Salford. Taxi firm New Moon confirmed its driver was uninjured, while the second driver is understood to have been released unhurt by security staff. Peel Holdings, which owns the site, has declined to comment. Photographs of the mishaps have provoked a number of jokes online. One person tweeted about the "ramping" up of security while another suggested the ramp had developed a "taste for oil".